The N.W.O.B.H.M scene never died: passing through tough times, it always survived temporary influences and evolution, and so it did in Mexico, where these BATTLE RAIDER come from. Faithful to this scene as moniker, logos and artwork, straight out of an 80’s promo, all witness, they are now releasing their self-titled album, after “Hard Flyer” LP, out for Fighter records. 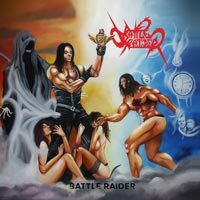 Using one of the worst seen album cover (although, to be honest, perfectly aligned with their genre), BATTLE RAIDER, as they did with their previous release, harvest from the early CIRITH UNGOL, IRON MAIDEN and MANOWAR, with no trying in hiding that. Using a thin and amateurish production, they deliver their music with more conviction than personality, but all in all keeping this genre ingenuity nearly intact, exceeding sometimes with vocals, often over the top. Keeping in mind all these points and therefore cutting them some slack, most of the track can be pleasant, considering just the niche they thrive in. “Flying Fingers”, “A Sioux Prayer” and “Commander”, for example, can be considered successful, with the latter being a sort of a mini suite, well played and composed, despite its length: in the opening, the bass line appears as if De Maio in person infused his magic into Edd Thunder. Although totally out of context, “Tartan Piper Alpha” is a fine track in mix and one of the best of this release. Personal experiences, some mystic and spiritual fugues lyrics fill the rest of the album. BATTLE RAIDER and their s/t release are out of fashion in all of their DNA but they don’t make a problem of it; on the contrary, they make a flag out of it: what should matter is to ask if their work has enough personality to go beyond quotes and references. Of course all is flavored, from start to finish, with an already heard scent and we can’t really find a notable peak in this Battle Raider but we can’t deny it a passing grade for their candor and how entertaining their work is.